Here is the new incarnation of this Mod, merged back all in one again! This corrects all the previous nasty bugs, inconsistencies and typos ((base+lite version) and some new ones too! Now they're starting to became quite a bunch! Gestaltzerfall, who updated TBSDec! Again, thank you! The squirrel-hound of typos Ratatoskr. Nafeij and our lovely moderator, Aleo. Oh, and of course huge thanks to Stoic too! Would have proven really difficult to mod a non existing game ! Feel free to report any bug or suggestion! Be careful, there could be huge spoilers! [FIXED(ENG)] Several typos in the dialogues and in the descriptions (string.json). [TWEAKED] Bellower (phase two) is now considered a "Rank 11" enemy, so, on death it will show (and will award) a "+10 Renown" banner. Holy cow, he's the Immortal Sundr! Pay some respect! 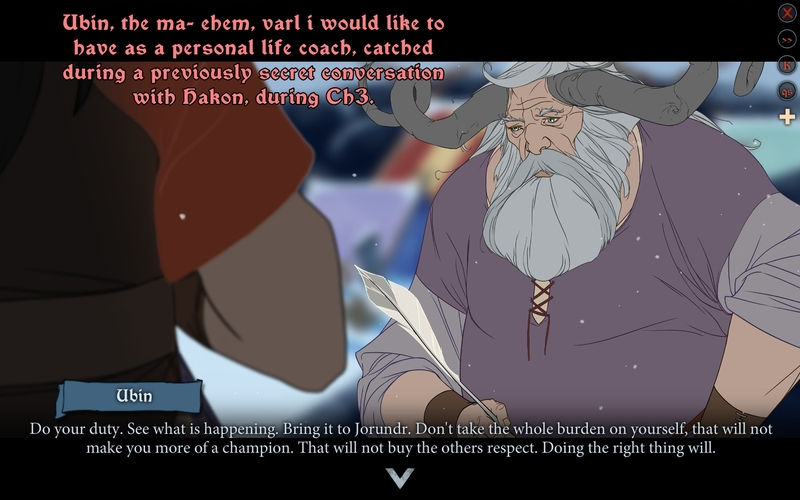 [FIXED]In Reynivik, if you help Sig (and win), following option #2 and #3, will end in having this text when you leave the village: "With some help you gather up the casks of mead and head back to the caravan, Sigbjorn and the other survivors in tow. The caravan gives the boisterous varl a large berth as you set out for Boersgard. ", but no one actually joins except Sig. [CHANGED] Unlocked Tryggvi by default, as explained in Aleo's thread. TO STOIC: If it's a problem, just let me know and i would remove that part. [CHANGED] Starting difficulty is now "Hard", so it will not reset to "Normal" if you start a new game, possibly wrecking the achievement if you didn't notice it soon. [FIXED](ENG) Several typos in map's, item's and unit's descriptions. For a detailed list of all the changes in "strings.json, look here. archive comes with backups just in case! (the ones with a .orig extension). Just delete the files and rename the backups OR verify the integrity of game files in Steam. It works with the latest version of the game - 2.49.02 - so any future patch will probably screw up something, but i'll try to keep it updated. Should work on GOG too. SSLTBS1-v2.20 - On the Nexus. SSLTBS1-v2.20 - On my personal Gdrive. I have been craving for those for so long! Amazing stuff man, cheers! I just hope that it gets officially fixed too at some point. After all not everybody is keen on modding their games, and not everybody bothers to check the forums neither. We should make a master-list of these small inconsistencies and fixes and apply them to the game. I am talking about parameter/stat tweaks like these, maybe add a few dialogue lines or poppenings etc. I will try to look into a more "proper" implementation of your dirty workaround for #3. Cheers up for the master list! Currently, i am not satisfied with the outcome of the varl thing, since in some cases it negates the "pressure" o remaining without warriors in Boersgard. a) (let Iver destroy the bridge OR personally help Eyvind in doing that) You left Einartoft with ~60 varls and, more or less, arrive in Boersgard with ~55 (it depends on the 4 loses of Krumr event and a couple of random events). b) (left Einartoft without destroying the bridge) You left with ~60+38 varls (without Krumr) and arrive in Boersgard with around the same number. Case b) feels a little bit odd already. a) Around 70 (55+15 from Ubin) varls if you help Eyvind. b) Around 113 (60+38+15) varls and no Krumr, if you left Einartoft. c) Around 163 (55+93+15) if you fight for three days on the bridge. So, it's still ok in case a but, unless you make them starve, it's totally pointless in case b and c.
1) Tweak the number a bit, reducing the 93 and 38 varls bonus and increasing Boergards accordingly. 2) Rework the entire thing in a manner that makes sense, for example, remove ALL the varl when you arrive in Einartoft, since they probably would gladly help Jorundr and other valrs instead of Rook. So, we need just to change Krumr event in some way, because in case a, it will make no sense. You seem too obsessed with this number-of-varl issue! If they affected the game that much, I would look more into it but, frankly, it doesn't seem worth the bother... In view of this, I would recommend going with the simpler (and more story-consistent) option #1: "Tweak the number a bit, reducing the 93 and 38 varl bonus and increasing Boersgard accordingly." I would personally leave it be as it currently is(with your original modification). Remember that there are many chances along the way for people to starve the caravan, loose fighters on war scenarios and random events, and for part of the caravan to leave you depending on your choices and actions, so chances are that many people will not have all that many Varls at that point of the game regardless, at least not on their first play trough. On my last play trough on hard i never felt like i was gonna run out of fighters on Boersgard anyways, so the new extra Varls for me are more a matter of immersion rather than a technical number to make the game easier. Resume: Don't change the numbers any further please. Last edited by Yellow; 05-10-2016 at 03:16 AM. Hi there, i've done a few modification/addition to the mod. NEW: Give a try in fixing that obnoxious misplaced tree. This is the best i can do, it's still a bit out of place, since it's a lonely round tree in a coniferous forest, but at least it stopped punching us in the eye. I considered also the possibility of just deleting it, but i hate to remove art assets. NEW: Fix a redundancy in conversation branch in the base game that granted two times the amount of varl joining and two times the loss of moral intended. - Reduced the varls granted by Ubin from 15 to 10. - Reduced the varls that joins if you don't destroy the bridge from 38 to 28. 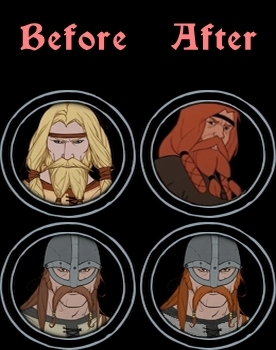 - Reduced the varls that joins if you fight three days on the bridge and let Iver destroy the bridge from 93 to 58, changed the text accordingly: "Many" to "Several"
Hoping you'll like the changes, i will update the version as soon i've don a bit of testing. Last edited by YaK; 05-09-2016 at 11:46 AM. 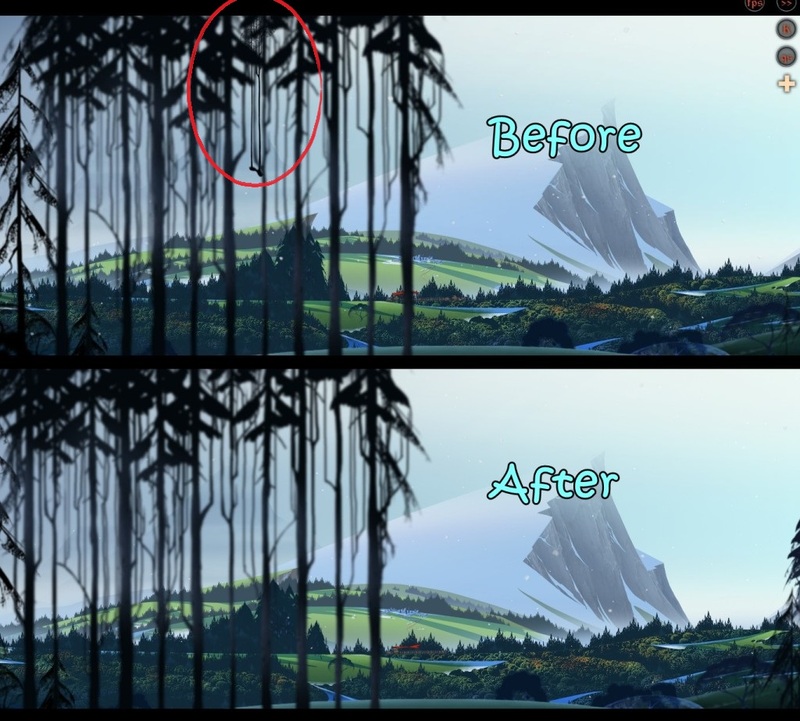 YaK is obsessed with Varl and trees I honestly never noticed that tree problem! YES! I'm obsessed with Varls You know, they're walking on the path of extinction, i wanna help but i am afraid of screwing up the ecosystem . I want also to keep possible the breach event in Boersgard, cause adding so many make it just impossible to let happen, also i you play really bad. 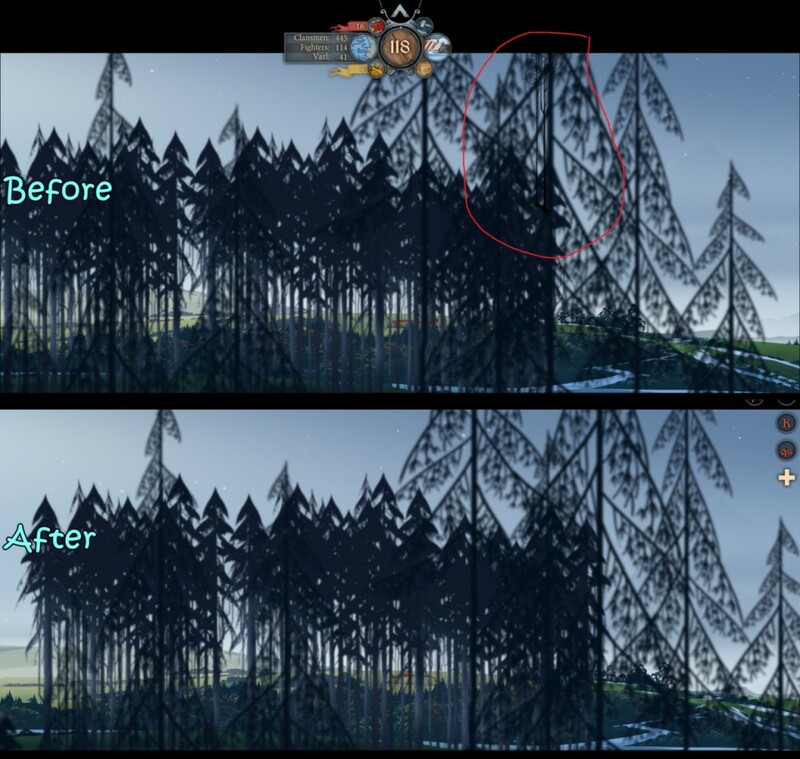 About trees... i didn't notice them until i read Yellow's post in the bug thread. Since then, i couldn't sleep anymore. It's better to sleep liyng against a tree than having a tree lying against you while sleeping, Aleo. Unless YOU are the tree, of course, so, just be the tree, okey? HAHAHA! That nailed it! While you're modding, why don't you add some Easter Egg stuff, like that, in the game? You know, a small poppening event, where a caravan member dressed in yellow makes a comment about a weird tree and Tryggvi responds in kind! Aside from that, I've noticed an odd beahviour with TBS Decompiler. When you edit files related to village/city, it seem to broke something when it recompile them, i noticed that with Frostvellr, but at the time i thought it was a single case, but it's happened again with Boersgard. Practically, the city screen is messed up, you see all location (market, heroes and so one) highlighted, but you can't click them. I resolved this letting Zeno1 do the recompiling. Just to let you know. Great stuff Yak, but could you please just delete that tree? It still remains an eye sore and it is clearly not meant to be there. Yeah, i am bit torn between the two possibilities. Just unzip it in "..\assets\saga1\scene\part4\wld_boersgard\"
Great thanks! A quick question thou, is that just for the tree, or does it includes the varl number hot-fix too? Last edited by Yellow; 05-10-2016 at 03:17 AM. Nope, wld_boersgard.json.z is only responsible of removing the tree. 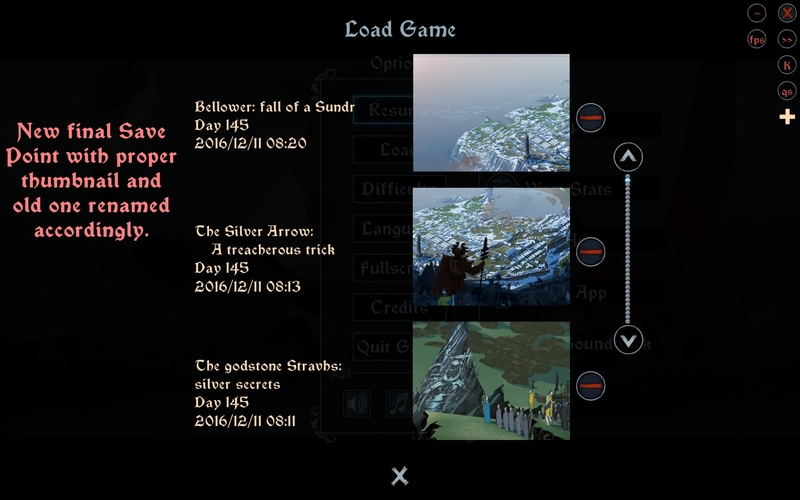 I read the Bug Report thread and it seems to me that many of the typos were already corrected (also the Tryggvi one), also, i have no idea how to change caravan composition to reflect the real composition. One that could be somewhat corrected is the one in which Rook wake walking behind Juno, but in the caravan Juno is behind him. With a magic trick we could let "behind" become "Beside"
Apart from that, do you know other inconsistencies/bugs that MAYBE i could be able to adress in some manner? What do you mean "change caravan composition to reflect the real composition"? The proportion of clansmen/fighters/varl to be consistent in the visuals, at least in close travel mode? That Rook/Juno problem can more easily be handled in the text, in my opinion. As for other inconsistencies & bugs, I don't recall any right now. Except from Gunnulf's stats in the tutorial fight; however, messing with them (specifically, zeroing his exertion) will "break" the tutorial, so it's no-no. Sure, "behind" to "beside" or "whit". Just wanting to spot a few other bugs to fix before releasing a new version just for that. 1- A typo reported on the steam forum. 2- Another ODD placed tree, in Chapter 2, just after the village in which Hogun & Mogul could/will join the caravan. What do you think? How could i address this? Probably i will try removing it or scaling up it and post here the results. the prereq is that you have already lost the cart with the treasure (and potentially lost Gunnulf, a condition which is addressed in the conversation), but the way Ubin it's handled by the game it's tricky, so at that point "narrator" (Ubin) it's already removed from the rooster, so the event don't fire up. It should happen after the cart event, but before Ridgehorn, since Ubin says that if Hakon will decide to go to there, he will follow and will write what he'll see there. Adding Ubin to the rooster after the cart event is fine and the conversation start in the next camp, but we don't want that lovely scrivener in the rooster, so i don't know exactly what to do. And here we are, theese are probably the issues that i will address in the next version. There is a think that bother me and i would really like to be able to make it in TBS: the onscreen "Morale Increaded/Morale Decreased" of BS2, I haven't the faintest idea of how to do that. Last edited by YaK; 05-19-2016 at 10:52 PM.